I love a good bagel, a good toasted bagel. 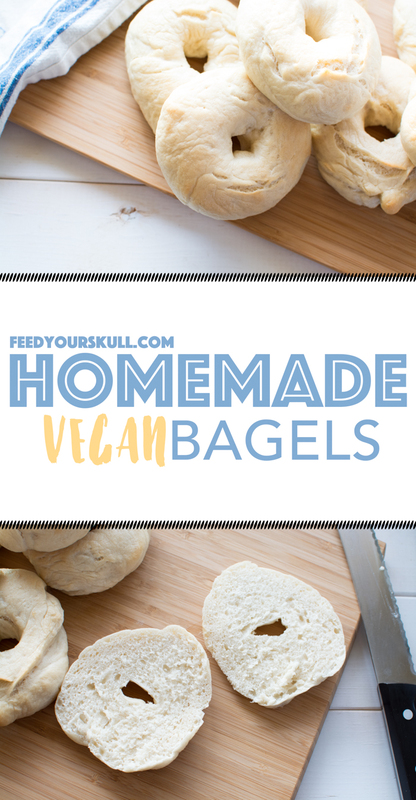 Vegan bagels. They should have a little crunch on the edges with a subtle chewy texture on the bite. Up until a few months ago I couldn’t remember the last time I had a bagel. Most varieties at the store contain milk and boast a long list of ingredients to ensure longevity on the store shelf and your counter. 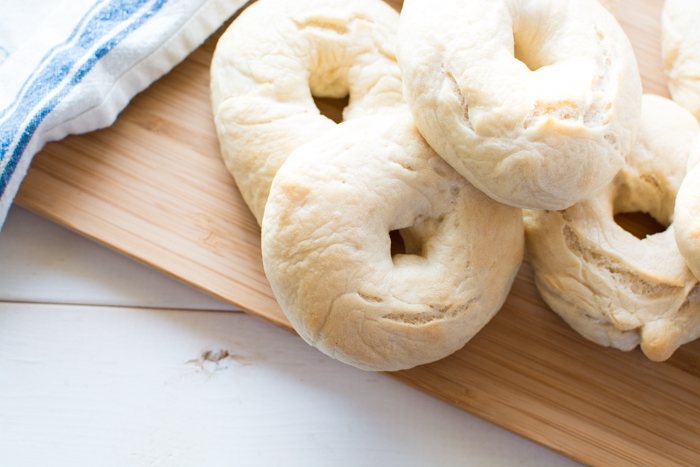 Homemade bagels on the other hand have minimal ingredients that you can count on one hand. Flour, sugar, salt, and yeast. Five if you count water. Some recipes include oil, but it isn’t necessary for a good bagel. Making homemade bagels takes a little bit of time, but most of that is waiting time while you let dough rise. But it’s all worth it because they are freaking delicious! I wish they were something we make weekly, but as with any food we go through phases where we make it for several weeks and then take a few months off. But every time you make them again, it’s hard to imagine where they’ve been in between. You don’t have to be a baker to master bagel-making, just have a little patience and understanding of the process. Mix the dough. Let the dough rise. Divide dough into desired number of bagels. Form bagels. Let bagels rise. Boil bagels. Bake bagels. Cool bagels. Cut bagels. Devour bagels. I used a food processor to reduce kneading time, but you could definitely make these by hand in a bowl. 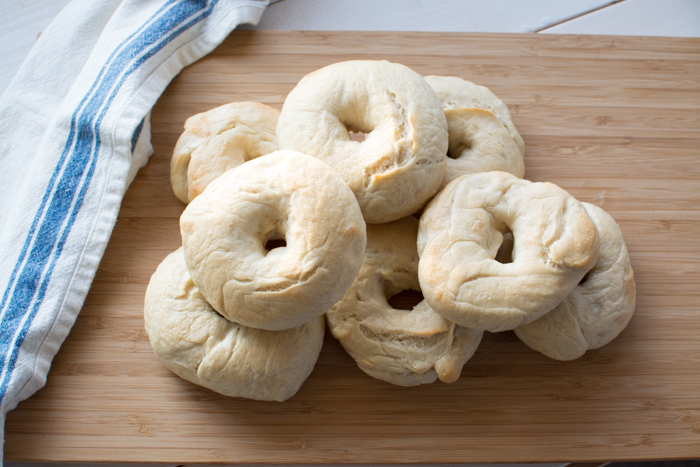 You can make 8 regular-sized vegan bagels or divide the dough up further for mini bagels. Preheat oven to 350ºF. Prep a clean surface or large wood cutting board with a couple tablespoons of flour, spreading it out evenly. Line a large baking sheet with silpat or parchment paper. Mix warm water (somewhere between 100-110ºF, medium-high from kitchen tap), 1 tablespoon cane sugar, and yeast in a bowl. Let sit for 8-10 minutes. This activates the yeast and will turn the mixture frothy. You want this. Add flour and salt to a food processor fitted with the dough blade (at least 9-cup capacity). When yeast mixture is ready turn the food processor on and remove the small pusher piece and pour in the yeast mixture while food processor is running. Let it run until ingredients form one massive dough ball. Turn food processor off and transfer dough to your floured surface. Knead about 1 minute until dough doesn't stick to your fingers. Place dough in a large bowl. Saturate a kitchen towel in hot water and wring out the excess—you just want the towel warm and damp—place towel over bowl and set bowl in a warm spot (on top of the stove, in the microwave, or in a dehydrator). Let rise 1 hour. 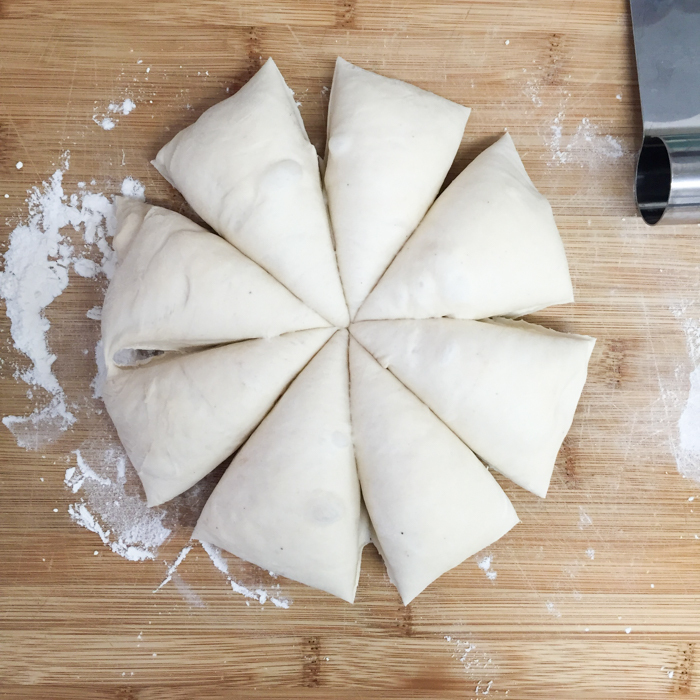 Once dough has risen transfer back onto your floured surface and using a sharp knife or pastry cutter, cut dough into 8 pieces or more if you want smaller bagels. Since the dough is usually in a circle, I cut it like I would a pizza. Take a wedge and roll it into a round bagel shape, next use your thumb to puncture a hole in the center. Pull the hole with your fingers as wide as you want. I go for quarter-size. Set bagel on lined baking sheet and repeat with remaining dough. Warm the damp towel in the microwave or repeat running it under warm water and wringing out. Place warm towel over tray and allow bagels to rise for 30 minutes. While the bagels are rising add water to a 4-quart saucepan—enough water as if you were cooking pasta—and bring to a boil. When water is boiling whisk in remaining 3 tablespoons of cane sugar. 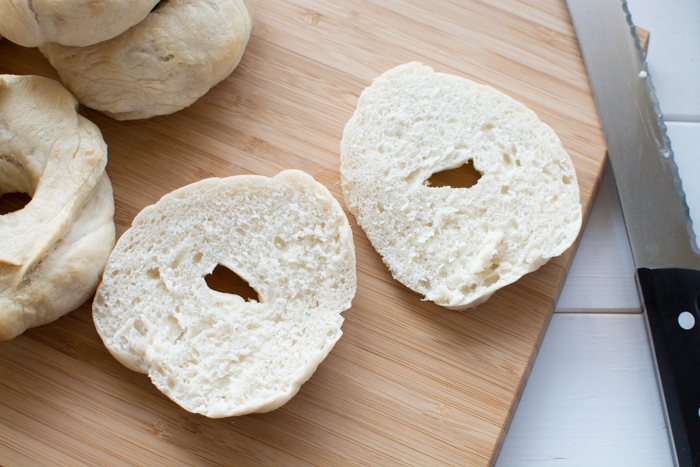 When bagels are done rising and water is boiling, drop 1-3 bagels into the boiling water—this will depend on how wide the surface area is. Boil each side for 30 seconds. Remove from water with a slotted spatula and set back on your baking sheet. Repeat with remaining bagels. When all bagels have been boiled place the cookie sheet in the oven to bake for 25-28 minutes. When done remove from the oven and transfer bagels to a wire rack for cooling. Store in a ziplock bag or resealable container. Bagels will last over a week or can be sliced and frozen for long-term storage. to attain a slightly darker bagel, mix a teaspoon of Bee-Free honey with a small amount of warm water and baste/wash on bagel before baking. I learned this delicious recipe from Derek Banas on youtube. I’ve been subscribed to his channel for some time, initially for all of the great code tutorials he does. Then one day he started throwing in a few cooking videos and you know what? He happens to eat a lot of low-fat vegan and vegetarian food. How cool is that!? I’ve adapted parts of the recipe and instructions to fit my kitchen movements. Back in high school my everyday lunch was a bagel with cream cheese and a milk. Times have changed and there’s way more greens in my current lunch, but I still love bagels. I would love to see your food pics! If you give this recipe a whirl, let us know. 💞 Leave a comment below and don’t forget to tag a picture with #feedyourskull on Instagram! 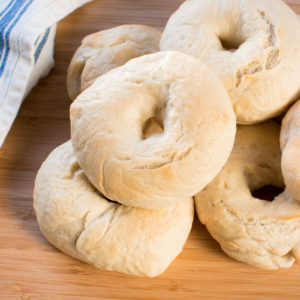 How do you seal these bagels before boiling them, they seem to stay open.